As I've been working on updating my journalism portfolio and website for job applications I've been gathering tips from other photographers to figure out the things that I am missing. These little things I've been trying to think about more, because they could set me above of other photographers. Earlier this week I was called to cover high school playoff sports for the Morning Call so I decided to focus on the emotion and reaction of sports teams. High school athletes, especially those in the playoffs, would be perfect guinea pigs to try to capture their intensity and emotion. I started out at girls field hockey as the sun was starting to set. I was disappointed to not get as many facial expressions here since their heads are often down looking at the ball. The two goals that occurred while I was there had minimal celebration so again disappointed. My favorite shot from the day has some emotion but most of all my eye was drawn to the angles that are created in the image. Unfortunately I wasn't able to stay through the end of the game to see if the winning team celebrated, I had to run to edit and get to soccer. When I got to soccer it was dark out, and the stadium lights cast some strong shadows depending where you were standing. 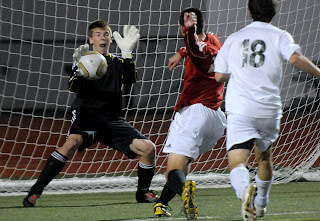 Found a spot that was better for the light and like the expression I captured as the goalie made a save. Emotion during the plays is important along with the emotion of when something good or bad happens to a team. I was pleased with this shot to show the good and the bad, one team celebrates the goal as the other slumps in disappointment. Due to my impending deadline I had to leave to edit and missed the reactions of double overtime and penalty kicks. Hopefully I'll have the opportunity in the championship rounds to stay through the end of the game for more celebrations and emotions.